The first article discussed the implementation using WebSockets and Kaazing Gateway (https://technology.amis.nl/blog/14777/push-based-synchronized-slideshow-web-application-implemented-using-websockets-and-kaazing-websocket-gateway). 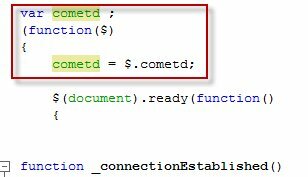 In this article, I will present an implementation using the CometD framework. 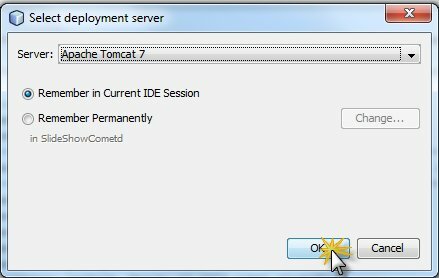 I will use NetBeans as my IDE, Tomcat as the Servlet Container to run the application on and a combination of browsers (Chrome, Firefox and IE) to try it out. 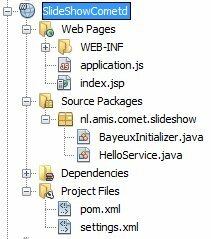 Earlier articles described how to set up NetBeans (https://technology.amis.nl/blog/14661/first-experiences-and-getting-started-with-glassfish-3-1-and-netbeans-7-x-its-a-breeze) and Tomcat (https://technology.amis.nl/blog/14688/installing-tomcat-7-and-configuring-as-server-in-netbeans) – these may be helpful to get started. 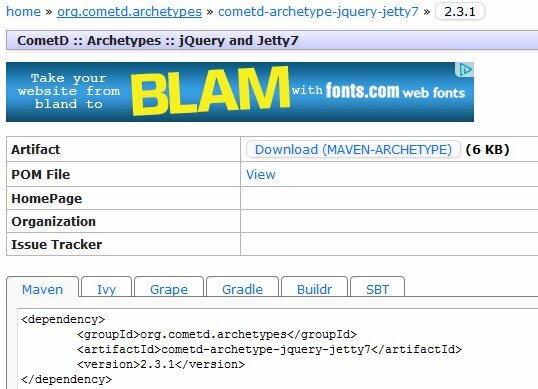 Another discusses getting the CometD demos running (https://technology.amis.nl/blog/14709/running-cometd-2-examples-locally-on-tomcat-using-maven-and-netbeans and https://technology.amis.nl/blog/14720/cometd-2-java-client-sample-open-project-in-netbeans-based-on-maven-pom-file-modify-sources-and-run-java-based-comet-client). 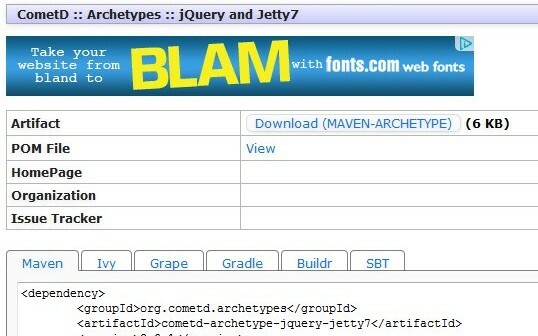 Using this information, I continue in NetBeans. 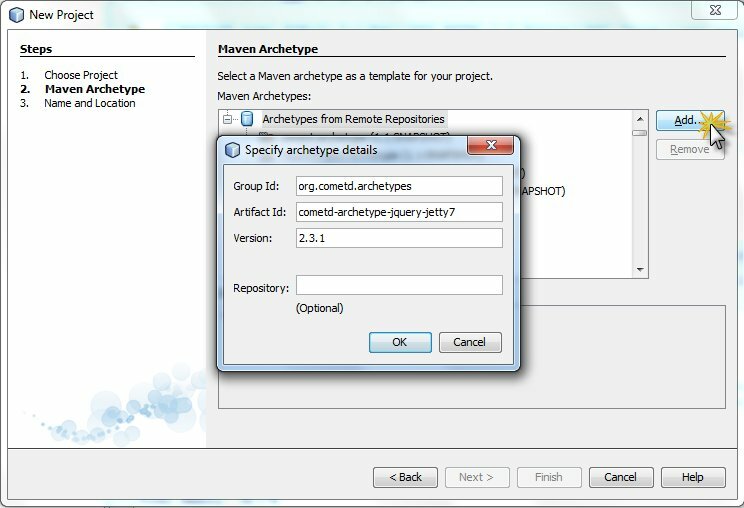 Select the newly created archetype and press Next. 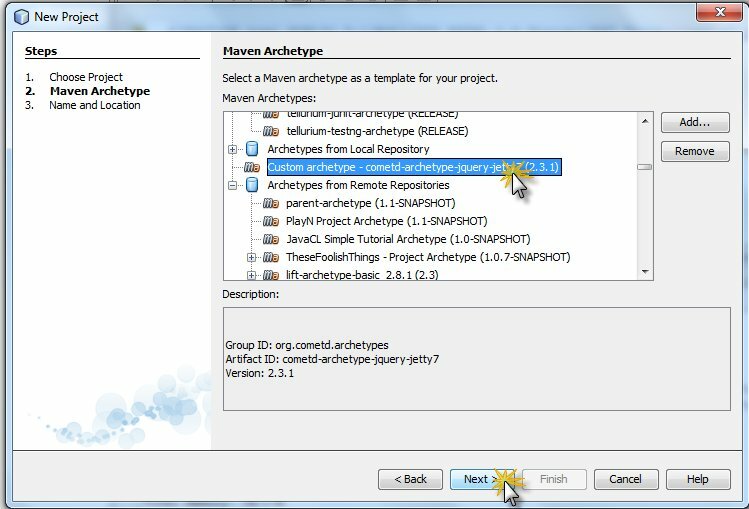 Enter some project details – such as the name and the location on the file system. Then press Finish. 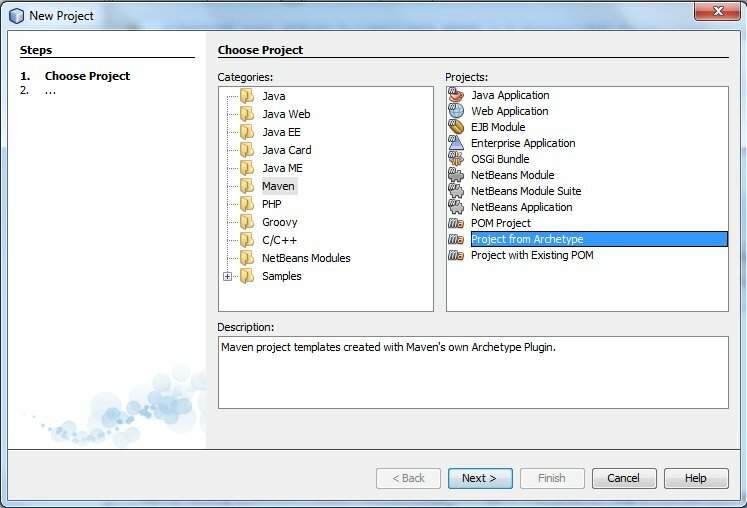 A brief interlude follows in which NetBeans downloads the required resources. and the browser is launched. The application is functional – even though the functionality is somewhat limited at this point. I have removed the generated code that leverages the CometD Echo Service to print out a demo message. Near the end of the application.js file, I have added a call to function setup(). 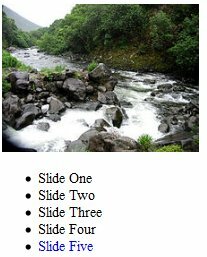 It initializes the slide variable – referring to the IMG element holding the current slide. It subscribes the function slideListener to the /slide/show channel. Note: no client or server side configuration of channels is required in order to start using them. The channel is ‘instantiated’ when the first subscription takes place. Based on the slideNumber parameter, adjustSlide will set the src of the slide variable (or the IMG element) to the url for the selected image. It then also highlights (in blue) the corresponding link. The message that is published is a Java object – that will be transported in some JSON serialized format. You need to see this in action – as pictures cannot really demonstrate what happens. 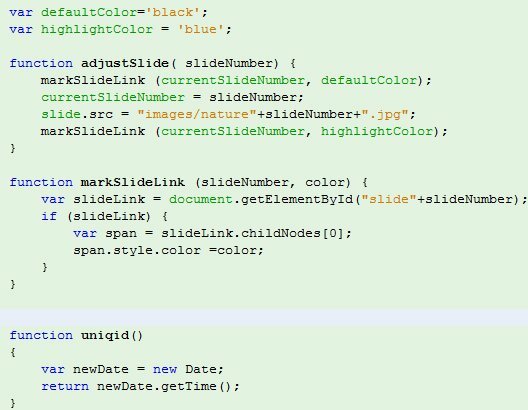 In addition to the HTML Web Client for the Slideshow, I want to implement a Java (possibly server side) component as well. This will be a Java Class that can connect to the CometD servlet, subscribe on channels and publish to channels. In this case the class would subscribe to /slide/show and listen in on the message exchanged by the web clients. 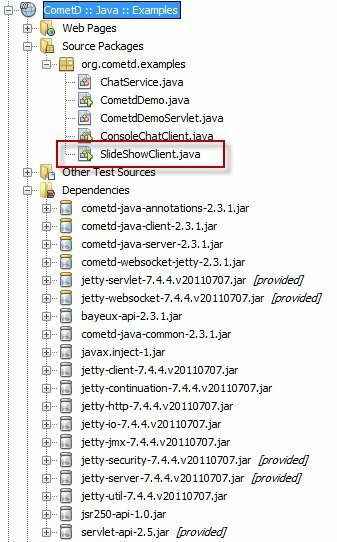 It can also publish slide selection events of its own to that channel, forcing slide selection for all connected web clients from within the Java code. The class has a main method that invokes the run() method. 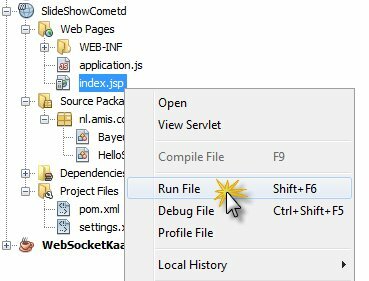 The run method contains some generic code for making contact with the CometD servlet – on the address corresponding with the deployment of the Web Application discussed in the previous section. In this case this is “http://localhost:8085/slideshow/cometd“. The InitializerListener that is configured on the “Meta Channel” is shown below. It is activated when the Meta Channel Handshake is complete and the connection to CometD is established. Its onMessage method invokes – when the connection was successfully created – the initialize() method. This method hands the client (BayuexClient) a batch of instructions to perform as one batch. The instructions are simple: get hold of /slide/show channel (either retrieve existing channel reference or create a new one) and subscribe the slideshowListener on this channel (and just to be safe and prevent duplicate subscriptions, first remove an existing subscription; this unsubscribe call does nothing if not subscriptions exists). 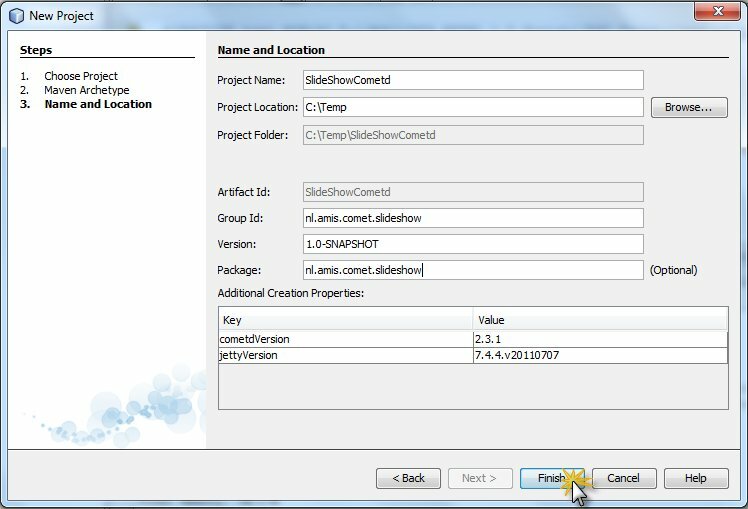 The slideshowListener is an inner class that implements the interface ClientSessionChannel.MessageListener. 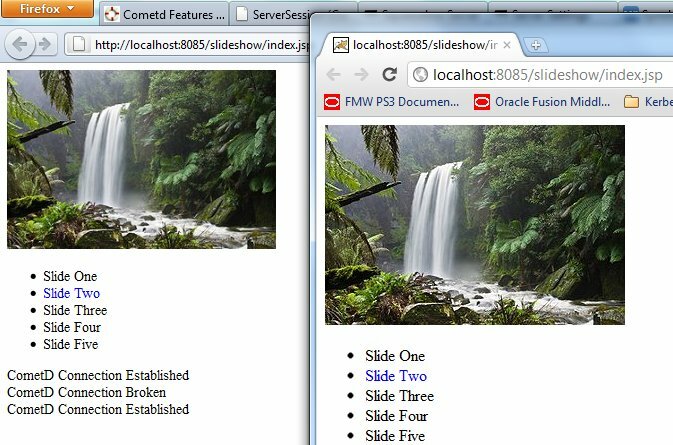 The onMessage method is invoked whenever the subscription on the slideshowChannel results in a message (that is: whenever an image selection event is published on /slide/show, for example by the web clients – or by this Java class itself. 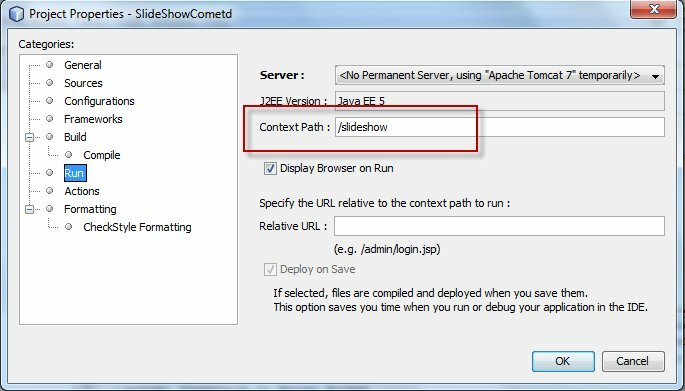 Download sources as described in this article: SlideShowCometd.zip.